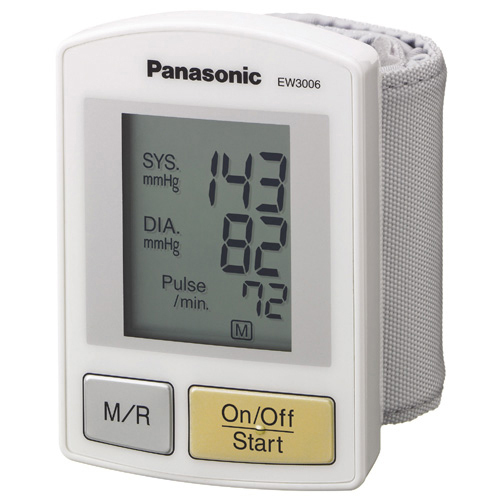 The Panasonic EW3006S is an easy-to-use, wrist blood pressure monitor that features 1 touch auto inflate and irregular pulse detection. This device lets you measure your blood pressure whenever and wherever you wish. The EW3006S is ideal for anyone who wants, or needs, to keep track of their blood pressure on daily basis. The system helps you monitor your physical health in the comfort of your own home or when on the go. The featured digital filter technology is sure to deliver an accurate reading every time. An automatic memory feature allows you to save up to 90 readings. Pulse Rate: 30-160 Beats / Min.